The electrostatic powder coating process is a method of applying electrically-charged powder coating materials to grounded parts. 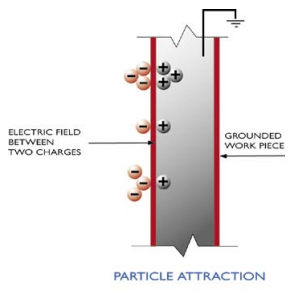 Powder is held to the part by this electrostatic attraction until heat is added to flow the powder together and cure it. There are four basic pieces of equipment that commonly make up an electrostatic powder spray coating system. They are the powder feeder, power unit, electrostatic gun, and powder booth recovery system. To start, the powder is supplied to the spray gun from a feeder unit where the powder is circulated by compressed air into a free-flowing state. The fluidized powder is then funneled out by high velocity air and is propelled through the powder feed tubing to the spray gun. The powder then leaves the spray gun in a diffused cloud being pushed toward the workpiece. 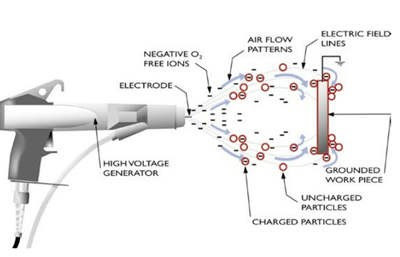 At the front of the spray gun, a high-voltage, low-amperage power unit supplies a charging electrode, which emits a charge that is passed onto the powder particles. This causes the particles to attach themselves to the grounded workpiece. Powder will retain a charge for several hours (minimally) if grounded properly. As the powder contacts a grounded surface, it induces an equal and opposite charge on the surface of the substrate. This occurs because like ions are repelled from the area. This reaction is called a “mirror” charge and serves to hold the powder particle in place. Larger particles typically have stronger charges, therefore larger particles will tend to build on top of smaller particles more directly on the surface. the air since less coating material is needed to coat each part. Selecting a spray gun is an important decision to make in the design of a spray system. Matching the gun to the application is of utmost importance. Failure to choose the correct equipment generally results in lower efficiencies, increased coating costs, increased emissions, and higher booth filter costs. TCI provides expert support, troubleshooting, testing, research, audits, equipment and defect analysis, corrective action plans, and training. More importantly, we dig deep into your operation to evaluate and identify the areas where we can optimize your process and lower your overall coating costs. Contact us today to speak with one of our professional service technicians. We can help you with spray gun selection or any of your powder coating needs. It is our pleasure to announce that Sandra Exum has joined TCI as a process engineer, effective August 3, 2015. Sandra will be responsible for understanding the process of how paint is made, and study methods to improve production, decrease downtime, and increase profit through research, equipment monitoring and improvement, energy efficiency studies, and implementation. Sandra is a graduate of Georgia Southwestern State University, with a Bachelor’s of Science in Chemistry. Previously, Sandra worked for Helena Chemical Co. and Royster Clark as a chemist analyzing the active ingredients of agricultural products. Sandra will be a great addition to the engineering department. Please join us in welcoming Sandra to the TCI family. We are pleased to announce Scott Fitzgerald as a new Quality Control Technical Leader Trainee. Scott will be in training on the floor for the next 3 months. Please join us in welcoming Scott to the company. Larry Spears has been a dedicated employee of TCI Powder Coatings and will be celebrating 20 years of employment this October. Larry started out on the Extruders then moved to Quality Control. In 2001, he moved into his current position as Inventory Clerk and has just recently been given a new role as Warehouse Lead Man. 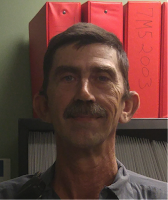 Although Larry was raised as an Army brat, he has settled in Ellaville for the past 21 years. Larry likes spending time with his family, wife of 14 years, daughter and granddaughter. Outside of work, Larry is an avid reader, enjoys puzzles, chess, and outdoor activities. Thank you Larry for your years of great service and commitment to TCI! Back Ionization is when powder layers start being repelled from the part during application and is primarily caused when the part has reached its saturation point, which prevents any more powder from being deposited on the substrate. Back ionization results in improper surface coating, which leads to a coating that is not suitable for corrosion protection. It also causes an “orange peel” type texture on the part, an undesirable look in most scenarios. The back ionization effect is more typical when applying a second coat on a part, but can also happen when applying first coats. Back ionization is also known as starring or starburst effect. Steve’s appointment is a sign of TCI Powder Coatings’ commitment to being a leading company in the coatings industry. TCI is confident that Steve will play a key role in providing and implementing high quality solutions for ABP customers. About TCI Powder Coatings: For over 25 years, TCI has been manufacturing powder coatings and dedicating itself to developing superior thermoset powder coatings and providing unparalleled service to its customers. About RPM: RPM International Inc., a holding company, owns subsidiaries that are world leaders in specialty coatings, sealants, building materials, and related services serving both industrial and consumer markets. RPM's industrial products include roofing systems, sealants, corrosion control coatings, flooring coatings, and specialty chemicals. Industrial brands include Stonhard, Tremco, Illbruck, Carboline, Flowcrete, Universal Sealants, and Euco. RPM's consumer products are used by professionals and do-it-yourselfers for home maintenance and improvement and by hobbyists. Consumer brands include Zinsser, Rust Oleum, DAP, Varathane, and Testors. Additional details can be found at www.RPMinc.com and by following RPM on Twitter at www.twitter.com/RPMintl. Click here to read the press release on our website. Who Says Appliances Have To Be Boring? There are innumerable everyday uses for powder coatings, and as with everything people want choices. The appliance industry is another market where powder coatings are seeing fast growth. Powder coatings provide both protective and decorative finishes for appliances offering both security and luxury. Appliances benefit from the decorative aspects of powder coatings on the front and side panels, as well as the protective functions of powder coatings needed for dryer drums, air conditioner cabinets, water heaters, dishwasher racks, and cavities of microwave ovens. Appliances are often overlooked but are an essential part of everyday life. In this design-conscious time, customers are just as interested in aesthetics as they are in functionality. Contact us today to speak with our experienced team about how we can help you with your powder coating needs. TCI Powder Coatings is a subsidiary of RPM International Inc., a multi-national holding company with a broad range of subsidiaries in the coating and sealing fields. RPM’s industrial brands are equally well recognized and regarded in the markets they serve. They are sold worldwide to contractors, distributors and directly to end-users, such as manufacturers, public institutions, and other commercial customers. TCI is proud to be part of RPM’s success and its commitment to market leadership. It is with great sadness that we inform you of the passing of Deacon Edward Hicks in July. 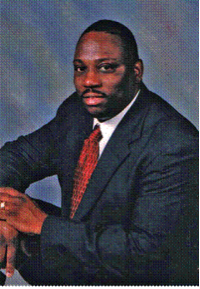 Edward was a valued member of our team having worked for TCI for 20 years, and he will be missed. As a Bonding Operator Supervisor at TCI, Edward was a wonderful employee who understood the meaning of the word "team." He was always more focused on the good of the company and the department than on his own benefit. He made many great contributions to TCI and helped it move forward in numerous ways. His work here will not soon be forgotten. “Edward Hicks loved his job. He loved the people he worked with. He truly thought of everyone here as family. That being said, he took his job VERY seriously. If something went wrong in his department, he took it very personal. He felt everything that went on there, reflected on him, not just TCI. Edward Hicks was a remarkable man and everyone at TCI is better for having known him. To read Edward’s obituary and more about his life outside of work click below.